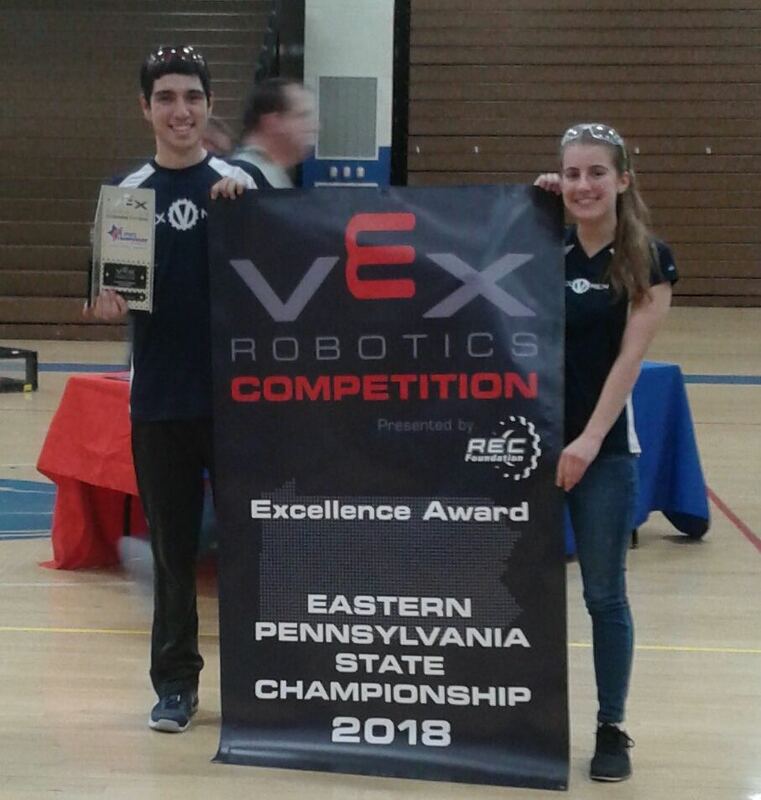 CHESTER SPRINGS, Pa. - March 5, 2018 - PRLog -- VEXMEN Team 91C Cyclops qualified for the VEX World Championship tournament by winning the Excellence Award at the Eastern Pennsylvania State Tournament over the weekend. Over 70 VEX robotics teams competed on March 4, 2018, at Norristown Area High School in the High School Division Eastern PA State tournament, which, due to inclement weather, was postponed by a day from the originally scheduled March 3 competition date. During the skills competition teams competed in the 2017-2018 VEX Robotics challenge In the Zone, which tests the ability of a team's (and strategic alliance partners) robot to build stacks of traffic pylon-like cones and place them in various scoring zones on a 12' x 12' playing field. Team 91C earned the tournament Excellence Award based on evaluation in multiple categories: tournament ranking, programming skills, and performance in all other award categories. The Excellence Award is the highest award presented in VEX Robotics Competitions. For this event Team 91C, which is sponsored by Laser-View Technologies, consisted of Nick Lubeck and Alexandria Lehman, who have competed, together and individually, in various robotics competitions over the past 8 years. Team 91C has won multiple awards and honors at every level of competition, most recently the overall tournament champions and Excellence award at the Spring-Ford High School Qualifier Tournament in Royersford, PA in February. The result at the Eastern PA State Tournament qualifies the team to compete in the VEX World Championship tournament to be held in Louisville, KY in March. The VEX Robotics World Championship is a one-of-a-kind robotics experience, where over 1400 teams from 30+ countries will compete to become the next World Champions. VEX Robotics is a leading provider of educational and competitive robotics products to schools, universities, and robotics teams around the world. The company partners with the non-profit REC Foundation to support the world's largest and fastest-growing competitive robotics program for elementary schools, middle schools, high schools and colleges. Brandywine Robotics is the charitable non-profit organization that supports VEXMEN. VEXMEN includes 30 High School and Middle School VRC teams comprised of more than 150 students. Brandywine Robotics also supports First Lego League teams that compete regionally and nationally. The organization consists of students mainly from the Downingtown Area School District, which participates in Project Lead the Way, the leading provider of STEM programs in the United States. Laser-View Technologies and its growing family of companies, including Dimetix USA (https://www.dimetix-usa.com/) and DIS Sensors USA (https://dis-sensors-usa.com/), proudly sponsors VEXMEN Team 91C Cyclops with the goal of promoting continued awareness and interest in the Downingtown, PA, Science, Technology, Engineering, and Mathematics (STEM) program and the importance of educating future engineers.